Will be possible to add automatically the date when using QSLOUT= 'B' or QSLOUT = 'D' in the SEARCH window ? When I send QSL via Buro , in the QSO window in QSL out I always put the date i.e. B 31/01/19. For one QSO it ok to do it manually but for exemple, working a DXped on several band, it will be really quicker to full this field using SEARCH window. So far, it is possible but only "B" or "D" is written. Adding the date will be very helpful for me ! Hope you'll understand what I would like, english is not my first language so it is no so easy to explain ! Normally the date is written when a QSL label or card has been generated in the program. I guess you are writing a QSL manually? Let me have a think abut this, maybe a right-click option on QSLOUT field to add the date - would that help? I did have some time on this, and I have added a right-click menu on QSLOUT field, I think one of the 6 options presented will give you what you want. It will be in next version release, due around mid-February, feedback on this will be appreciated. Yes I I write all QSLs manually. Date is written automatically when I valid a QSL I received (or a electronic QSL usign the "V" letter). Thank you for the new implement, be sure I will test it when the new version will be available and I will give you feedback from this post. Sorry for delay, I have just updated my setup to rev.25. So I try what you have added. Thanks Colin, just updated to rev.26, it is working good ! Today I checked my log to updated my DXCC credits, QSO etc.. and the bug is still here. 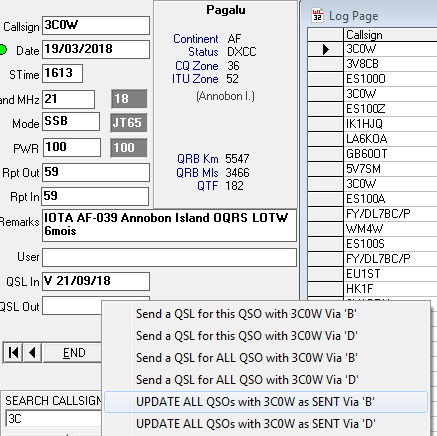 Right click on the QSO, choose "UPDATE ALL QSO WITH *** AS SENT VIA 'B', the next window which appears is "Do you wish Update QSL as 'SENT' for all previous QSO with *** via D". Choosing "YES", all QSO has been marked "D" and the date, not "B".